Beet noodles are a fun way to eat this antioxidant-packed veggie! 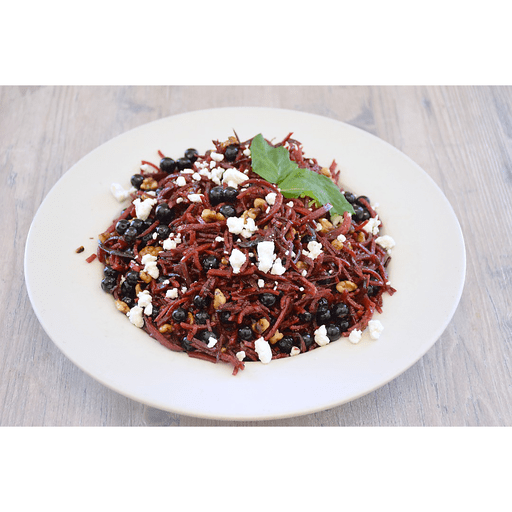 And, tossed with blueberries, walnuts and goat cheese, this crunchy and colorful Beet Noodle Salad is delicious and nutritious. 1. Prepare the dressing by whisking together olive oil, balsamic vinegar, honey, and salt. Set aside. 1. Place beet noodles, blueberries, goat cheese crumbles, walnuts, mint and dressing in a large bowl. Toss together. Serve and enjoy! Calories 300, Total Fat 25g (Saturated 4g, Trans 0g), Cholesterol 10mg, Sodium 80mg, Total Carbohydrate 17g (Dietary Fiber 4g, Sugars 11g), Protein 5g, Vitamin A 0%, Vitamin C 10%, Calcium 4%, Iron 6% *Nutritional values are an approximation. Actual nutritional values may vary due to preparation techniques, variations related to suppliers, regional and seasonal differences, or rounding.